The good understanding between employer and employees is important for an organization to grow. Employees are an important part of the organization but when these employees do unacceptable behavior it becomes the problematic situation. There are various situations which causes due to unacceptable behavior of employees and it is important for an employer to deal with these problems accordingly and effectively. Some employee feels it hard to accept and follow company norms and do behave in a certain way which causes problems for an employer to deal, but you can’t just fire them because they are not following company norms. So how to deal with unacceptable employee behavior? In this article, we are going to learn how to deal with unacceptable employee behavior without affecting company image and reputation. Read this article further to know more. There are certain behaviors which employees can’t do, according to company policies they are unacceptable behavior. These unacceptable behaviors are mentioned in company’s policies manually for employees to know. These behaviors can land employees into serious trouble as well in extreme cases make them get fired from the company. Good employees work together as a team to reach the goal and work hard but some employees do not believe in hard work and bully others to do their work or not do it at all. Bullying in the office of any kind is unacceptable behavior as it affects working of another employee as well as company reputation gets affected even in some cases. The good employees choose other organization to work rather than get bullied by others. Good employees work together as a team to reach the goal and work hard but some employees do not believe in hard work and bully others to do their work or not do it at all. Bullying in the office of any kind is unacceptable behaviour as it affects the working of another employee as well as company reputation gets affected even in some cases. The good employees choose other organization to work rather than get bullied by others. We all know how to behave with others in public places as well as in the office. We all learn about good manners in our schools and college but few of them don’t know the meaning of good manners. Bad manners in office is considered as an unacceptable behavior, it disturbs working environment as well as create discomfort between other employees. Bad manners by some employees disturb the whole workplace and tempt others to do as well. Harassment is considered as an illegal and punishable offense. Harassing other employees verbally or physically is totally unacceptable behavior and can land that employee in legal matters as well as tarnish organization image in the marketplace. Harassment in office by another employee can mentally disturb good hard working employees and can force them to quit the job. Harassment in any way is unethical; illegal as well as punishable no matter who you are. There are laws for workplace harassment, rules made by organizations also work to stop workplace harassment. This is something that happens to each employee at least once in their life when they go to the office. We all got late at least once in a while when rushing for the office due to many reasons but, few employees make the tradition of coming late regularly or leaving early. Coming late for work regularly is unacceptable behavior as it shows a lack of commitment towards the job, decrease working morals in the organization and tempts others to do the same. Some of the employees have a tendency of using abusive words in general conversation which goes with them to the office as well. Using abusive words in the workplace is totally unacceptable, it often disturbs other employees as well as disturb working environment. Some of the employees feel uncomfortable when abusive words are used during a conversation, on the other hand, some take serious offense when abusive words used against them. Anger is one of that emotion most human hardly have control. But showing anger in your workplace is a big no, showing anger can lead employees to trouble. when we talk about the unacceptable behavior of employees, losing temper over small things count as unacceptable behavior. Employees who have anger issues become a threat for other employees as no one knows when they will burst out, even sometimes anger harms their quality of work as well. So, the angry behavior is totally unacceptable. Most companies and big organizations give freedom of dress up but it doesn’t mean the employee can wear whatever they seem fit. Not wearing appropriate dress only means trouble and inappropriate dressing comes as unacceptable behavior especially if it creates an issue between other employees. Dressing inappropriately may tempt others to make inappropriate comments which can disturb environment of the workplace. Disrespectful behavior towards other employees and supervisors is unacceptable. Disrespecting can cause fights and politics in offices as well as cause decline in work ethics of other employees. The disrespectful behavior of employees leaves an impact on company’s reputation as well. Most employees in organizations know good manners and how to behave in office as well as have great work ethics, but few of them don’t know what acceptable behavior mean and how to behave properly with other employees and office staff. Unacceptable behavior by few of employees causes a big headache for supervisors and managers as they are the one who take most heat from employees as well as higher authorities of the organization. These few employees don’t understand the importance of acceptable behavior in the workplace and cause discomforts and inconvenience for other employees. So the question is how to deal with unacceptable behavior? 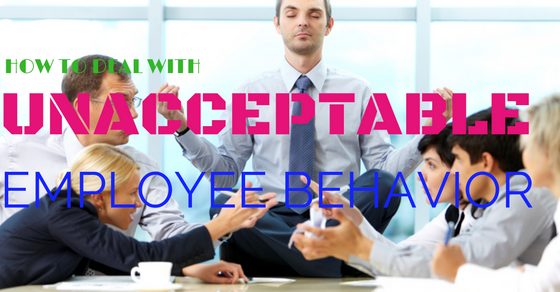 Dealing with unacceptable behavior and the employee is not easiest of the task. It needs lots of patience, compromise, understanding and strictness to deal with unacceptable behavior. Follow these steps to deal with unacceptable behavior. Making rules and regulations can help in maintaining uniformity into the office. Rules bound employees behave properly and regulations keep them on the track but strict rules and regulation can scare the good employees and they will feel suffocated in that type of environment. Try to maintain a balance between rules and happy working environment. Make policies strict about misbehavior and praise good working and behavior, that way employees will feel motivated to behave well. Make message clear during hiring process about needs and expectation, what you expect from your employees and what are the work ethics in the office. The different organization has different needs and requirements they want employees to fulfill and also have certain ethics to involve in their working. To avoid later misunderstanding and unacceptable behavior from your employees, make the message about need and expectation during work hours clear, making message clear helps you in dealing with unacceptable behavior. Make a list of employees’ behavior and their character by observing their attitude and how they converse with other employees, that way you will better know how to deal with the unacceptable behavior of employees. Observations also helps you in noticing where you need to make improvements in the work area and what to be included in the rule book. Maintaining what you observe in document and listing can help you when you deal with employees who are lacking on the behavioral front without accusing the wrong employee. Follow up those employees who make the same mistake again and again as well as those who are making progress. By follow up you can take action against those who are not making any progress as there must be a guideline about those in your company rule book as well as you can give positive feedback to those who are making progress steadily. Praising good work and strict action against misbehaving gives a clear message to other employees as well. There are some genuine problems with people who work long hours in the office. When you confront those employees who are behaving in an unacceptable manner like coming late regularly or leaving office before the end of their shift, try to understand why they are doing this. It happens sometimes that employee started to behave in an unacceptable manner due to their personal problems and need supportive hand rather than scolding in office. Try and understand as they are also a human being and give time so that they can go back to their old self. Employees hardly pay attention to company norms after they got selected for the job which leads to unacceptable behavior from them. Clear company norms to employees about work ethics and behavior will help you in dealing with unacceptable behavior in the workplace as well as you will have more authority over employees to take actions when you make all norms clear. If you find any employee misbehaving and even after warning they are not making any progress then have a private conversation with those employees. Scolding in public may tempt them to rebel and can hurt their ego as well as public humiliation can decrease their self-esteem. Have a conversation in private and talk about their unacceptable behavior and warn them about consequences they are going to face in case of ignorance. Private conversation is more successful than public scolding and humiliation, no one want to feel like a child in front of their colleagues. Don’t take a biased decision on the basis of heard stories and complaint from others. Sometimes supervisors or managers take action without confirming the culprit which leads to a biased decision and also affect work ethics of other employees. Do conform yourself and understand why it is happening as well as keep track of other employees as well. The present is the right time to make decisions and take actions. Ignoring unacceptable behavior makes employees confident about their behavior and makes other employees question your decision-making skills and judgments. If you have proofs of unacceptable behavior then take action immediately and set an example for others. The right time will never come if you are sitting in wait for right time to make an important decision. You are the one, people look after in workplace to set everything right and your decisions affect more than you think so make a decision on time. Counseling is the better approach than scolding employees. Counseling helps them in improving as well as you need to understand the reason of their behavior more specifically. Involve your employees in counseling sessions where they talk with experts and share their problems as well as got guideline for the workplace behavior. Counseling always proves better when you deal with employees who are not behaving as per standard and rules as well as you have a clear picture of the problem which helps in dealing with the situation in a better way. Managers and supervisors are the ones who take heat from management as well as from employees. Back up your decisions and action from higher authorities and human resource department. When you have support from top management for your decisions employees listen to you way better than, when you don’t have any backup from authorities. Rise behavioral issues in public meetings so that all employees can get the message and higher authorities can know about the problem. If higher management knows about the problem, you can ask for better guideline and rules to make sure employees behave in a proper manner. Dealing with employees who can’t behave properly is a big headache for most managers and supervisors. Most employees know how to work and behave in the workplace but there are some who got the problem in getting the right picture. There can be the various reasons for this kind of behavior such as cultural differences. The best any manager can do is to try and understand the situation but in some cases, they need to take actions and make decisions so that company doesn’t suffer the consequences. We hope this article can help you in dealing with unacceptable employee behavior.